Believe it or not, it’s now 22 years since the Volkswagen Golf Mk4 first appeared. Yet despite its advancing years, the design approach of evolution rather than revolution means that, even today, the Mk4 looks relatively modern. Its smart and simple lines and instantly identifiable shape give it a look that still isn’t out of place among modern traffic. Yet despite being a handsome car, the Mk4 Golf somehow still feels a long way from being a classic - more so, in fact, than a good number of its contemporaries. And that’s a shame, as it was one of the best cars of its era. One of the reasons behind its current anonymity could be because the halo model, the GTI, was a bit of a disappointment. In 2.0-litre 8v form, it had very little in the way of performance and was a bit too soft around the edges, leading critics to suggest that Volkswagen had made a GTI for estate agents rather than enthusiasts. It was a fair criticism, and while the later 180bhp 1.8T livened things up a bit, it was still never the driver’s car that Golfs of old had become. Yet there were other Mk 4s that were technologically far more interesting. The 2.3-litre V5, for example, which was an interesting curiosity. Or the 2.8 V6 4MOTION with four-wheel-drive. 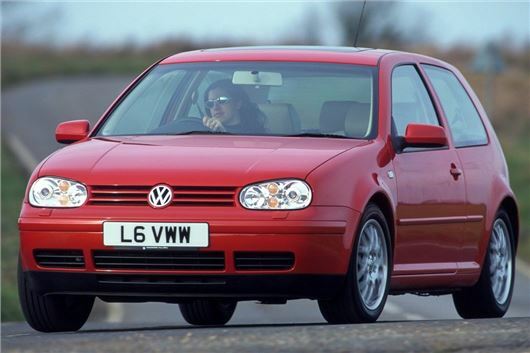 Then there was the R32, a 3.2-litre V6 that proved that the Golf was, well and truly, capable of acting the role of a true performance car, even if its critics begged to differ. Performance variants aside, there was also the matter of it being a classy, refined small hatchback. It was, for several years, the most sought after car for sale on Auto Trader, while there was a period where traders were buying automatic models in the northern counties and driving them down to London to sell them, such was the demand for two-pedal Golfs in the capital’s hustle and bustle. The fit and finish of the interior trim was leagues ahead of many rivals, and in addition to that it came with blue dashboard lighting - a unique feature that won praise from motoring journalists and fashion victims alike. It mattered little that the ‘cooking’ 1.4 and 1.6-litre Golfs came with old-tech powertrains, nor that the 1.6 auto was little different mechanically to the Golf Mk 2, as the Mk 4 was a handsome, sturdy and very well-finished car that was very much a catalyst behind Volkswagen’s move upmarket as the 20thcentury came to an end. Then came the diesel models, which could do no wrong. Available in four power outputs - 90, 100, 130 and 150bhp, the latter two were touted as some of the first proper diesel ‘performance’ cars. If the TDI had a red ‘I’, it was the full-fat model, and a very desirable thing indeed - for years, car dealer would refer to the ‘Redeye’ as pretty much a licence to print money. In time, it turned out that the Mk4 wasn’t as sturdy as it first appeared, with a fondness for rusty wings, worn-out seat bolsters and creaky suspension at odds with its indestructible image, while niggly engine faults such as crank sensors and MAF sensor issues could also frustrate. Overall, though, the Mk 4 is a dependable enough car, and one that still has a decent following as a slightly premium banger - something that tempers its classic credentials, but only for the time being. As picky banger buyers are moving their demands further and further upmarket in the sub-£1,000 car market (more fool them, given the cost of repairs to particular filters and emissions sensors), numbers of Mk4s are currently in freefall and they’re disappearing fast. Yet if you find a smart, well-looked after example for a sensible outlay and avoid anything that has been badly modified, you’ll find yourself behind the wheel of a pleasant, likeable and quite charming old car that still manages to avoid falling into any specifics social class. There aren’t many cars that can do that, and that’s why - in the fullness of time - the Mk4 Golf will earn its classic credentials. -New, the front wiper arms were misaligned. -Continual steering geometry check-ups, probably due to the heavy diesel engine whacking everything out of alignement. -At 56000 kms an injector had to be replaced. -It spewed white diesel fumes at an embarrassing rate, and smelled awful in the cabin. -To cap it all, the auto packed up at 86000 kms and the local dealer in Belgium wanted 8000 euros to replace it. He offered me 700 euros to retain the car so 'i buy a new one'. Little by little, because I am a car nut, I fixed everything. Woe to to him or her that gets a car like that unknowingly. -A great drawback of Mk4 Golfs you will discover the hard way when it snows. The door edges get iced so firmly that a fearsome amount of yanking won't get them free. --This, now applies to ALL Golf 4s : Without exception they have terrible stoplights and chew bulbs at an alarming rate. Headlight bulbs at least every six months; stoplights trimestrial... Down the road you can always signal an MK4 because the stoplights are off. There were a few pluses: an unrivalled corrosion resistance; the underside of my car, until it was stolen at the university town of Leuven in 2014 -a day that will remain forever in infamy, was like clean beyond belief. -Great factory alloys, German made Ronals were quality items. -Street credibility that came, i am afraid, at too high a cost. I swapped my 4th Golf GTI, a Mk 3, for an early Mk4 GTI, with the 1.8 20v engine, which although smooth and quiet, lacked torque and never felt like 125hp, it seemed slower than the earlier 1.8 8v Mk 3. In most respects my Mk4 Golf was a nice car, but I found it a bit scary to drive fast, the power steering was over sensitive, and the car felt unpleasantly tippy-toe on fast bends, but maybe later ones were better. I replaced the car with an Audi Avant with a 2 litre all aluminium version of the same engine, which was a huge improvement. The Audi's only real fault was its thirst for oil, but the ride and seats were much worse than the Golf.